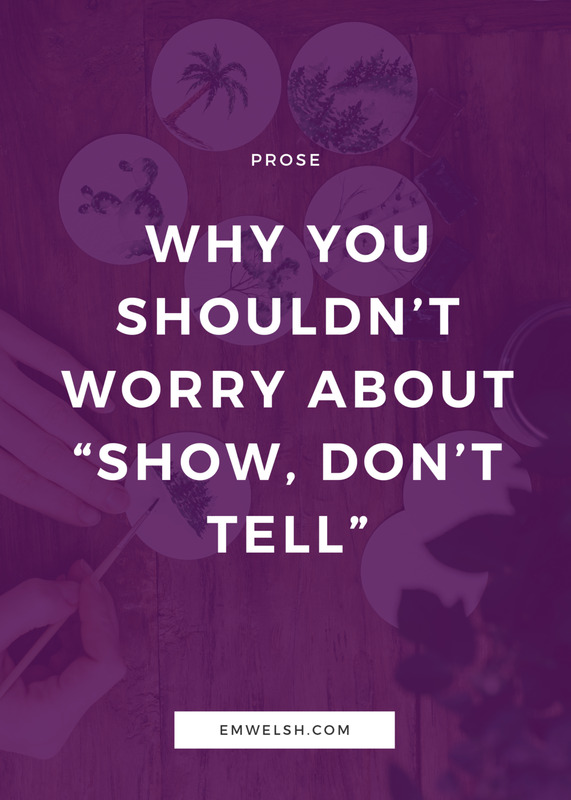 Why You Shouldn't Worry About"Show, Don't Tell"
If you sit in a creative writing class today or read a book on the craft, you'll likely hear at some point about the hackneyed "show don't tell" rule, and maybe for a long time you've followed said rule. To clarify, it is not really a "rule" in the way we understand it, but instead exists as an unspoken standard all creatives are supposed to strive for in prose for it to be considered "good," so that "bad" prose is telling and "good" is showing. Which is not true. I remember a girl in my own creative writing class always jotting down the note, "How can we show this instead of tell it?" and I absolutely hated that note, but she lived by it and it showed in her work, which I was frankly bored with. Maybe it's because breaking this rule is the only way my otherwise rule-following personality can achieve any sort of rebellion, but I really can't stand this rule the same way I can't stand the Hemingway practice of cutting out adverbs and adjectives. "Show, don't tell is a technique often employed in various kinds of texts to enable the reader to experience the story through action, words, thoughts, senses, and feelings rather than through the author's exposition, summarization, and description." To me this rule is limiting because it simplifies the craft down to visuals. If you want to write a visual story where you "show" and don't "tell", write a movie. In fact, my creative writing professor once told me that given that anything can be adapted as movie now, prose writers must have a stronger reason for making their work a novel instead of a movie and I believe said reason can be found by understanding what makes the novel so different from a movie (*Wink wink* What the whole Storytelling System is all about). And what makes it so different is in fact that a novel does a whole lot of telling where a movie does a lot of showing. Of course, this rule exists for a reason and still should be learned in the beginning stages of writing, but over time I have found this rule to make pieces very stale if emphasized too much, just as too much telling can also make a story very drab without any visualizations. The rule is about finding a balance, but this post is not about helping you do that. It's about shaking off the standard as to what is perceived as "good writing" by tossing out an old rule - at least for now. Until recently, I had actually never heard anyone contest this rule - at least with such passion as I am now. I thought it was sacred and something we should all strive for despite having read countless authors (most being my favorite) who did just the opposite of that. Inside I loathed this technique, but I was so sure my thoughts were radical and coming from a place of ignorance that I never voiced them. That is until I read the Wonderbook, a great book on the craft of writing (it's the only illustrative book on the craft I've ever seen. It stimulates the imagination in ways other writing books cannot), in which Kim Stanley Robinson totally tore down the show don't tell rule and I finally felt confident enough to tear it down myself. To use an example, I'll talk about my current favorite author, Gabriel Garcia Marquez. Given that he is a Nobel prize winner, it's hard to call his work "bad," though his style may not be to your taste (and that's just what I'm getting at), he is regarded in general as "great" and therefore the perfect person to test out this show don't tell nonsense. Because he breaks all of these rules. His book One Hundred Years of Solitude reverts back to the narrative form in which there is absolutely no dialogue and plenty of "telling," all coupled with flowery language. And it's beautiful. Take for example this quote I have copied below from him in which he does nothing but tell. It's two sentences that do a lot of telling, but which still make the reader feel empathy. "Colonel Aureliano Buendía organized thirty-two armed uprisings and he lost them all. He had seventeen male children by seventeen different women and they were exterminated one after the other on a single night before the oldest one had reached the age of thirty five." But Garcia Marquez isn't alone. Some of the oldest stories we know to date all do a lot of telling and not so much showing. In fact that's how storytelling started - orally. People would sit around and tell stories to each other and maybe people would insert themselves into the work to ask questions, much like how Heart of Darkness demonstrates in its narration or Dostoevsky's novels. The show don't tell rule omits any sense of playful narration. It pushes authors to sound uniform and stifles what might be an incredibly unique way to tell a story. It asks the writer to ignore the elephant in the room, the reader, who will one day potentially hold the story in their hands, and ask them to write omnisciently, even if that's not their style. I'm a big believer that every story has a narrator, even if it's a secret one, that is separate from the author. Even if the narrator is the author, it is still a characterization of the author (think about Dante, Chaucer, etc. ), which means that sometimes, whoever is narrating your story, might want to tell the reader something. Maybe it's backstory. Maybe it's an explanation. Maybe it's a simple description. Or maybe it's absolute crap. The key question here is not whether you are showing or telling, but what either does for your narration and which is better. However, with a rule like "show don't tell" we are taught to ignore this narrative voice and later then must relearn how to find it, if we ever can. It's not to say that by writing a novel in which everything is shown and not told there is no narrational style or voice, but that by focusing too much on this rule you are inherently forcing people whose style might be more classical to back off that which feels true to them. The truth is, when you are telling people something in your story, you are omitting a lot of ambiguity. And that's okay. Because oftentimes instead of telling a story, we try to show it so that readers can bring their own ideas to the table and should they get the wrong idea, we can simply tell them that they interpreted it differently or even "wrong." Yet when we tell the reader exactly how things are, we are taking a bold step many are not ready to make. And while telling something to the reader can still be ambiguous - look at all the confusion that still exists in epic poetry - it also stands to be a very courageous choice, especially in a time when visual stories are preferred. Of course, my hate against the show don't tell rule does not exist in a vacuum and I am obviously talking about it in the most extreme sense. In fact, the rule was founded on very good wisdom for new writers and maybe even more seasoned ones, I just believe it's come to define writing too much. But in truth, sometimes as writers we can over-tell things, give too much information instead of hinting at it. This over-telling is perhaps because we don't know enough about the story ourselves. I find that when I "tell" the most in my work is when my subconscious senses that something has not already been defined or defined well in my work. If the relationship is bad between two siblings, directly saying so can oftentimes omit any imagination for the reader. You've got to demonstrate just how things are bad instead of showing it.Luckily my friend Kristen details how to do this super well in her article on how to balance the rule. But to play devil's advocate to my devil's advocate, perhaps in saying a frank sentence like "The siblings did not get along," is part of your style or part of the narrator's voice and that while such a statement may seem simple and direct at first, is really getting to something entirely different. Maybe the siblings want to murder each other, so such a sentence that seems to "tell" instead of "show" is really not telling anything, but lying to the reader. Who knows? It's all in how you sell it and how it works with all your other sentences together. Is the show don't tell rule for you? The reality here is that like all things in life, fiction follows trends and often as writers we feel the pressure to follow and imitate whatever is hip in the writing world. However, because I love medieval literature and epic poetry, most of what I read does a whole lot of "telling" and not a lot of showing, so my writing tends to mimic those forms. However, if you write visual stories with complex and beautiful sentences and that's what you do, do it. Don't let me tell you what you should and shouldn't do, because if it works for your style and your voice, there is no reason to change because some random blogger decided to hate on everything your work embodies. I'll probably still like - even love - what you create. Instead, this post is for all my fellow writers out there, specifically those young in their craft, who have come to believe their work is bad because it tells instead of shows. Do not ever allow a literary mantra to hold you back from something you believe works. What do you think? Has the show don't tell rule become too ingrained in us as writers? Or is it something we should still follow?